Previous Boston Musical Intelligencer reviews (here and here) described the Freisinger Chamber Orchestra’s performances of major works by Bach, but Sunday’s performance in the sanctuary of Boston’s Old South Church revealed a more playful aspect of the ensemble and took a rapt audience through vibrant performances of works by Mozart, Haydn, some 19th-century French arias and a commissioned work by Dan Shore. FCO performances tend to be informal affairs; audience members frequently find themselves walking in on last-minute rehearsals mere minutes before the start of the concert. Conductor Peter Freisinger frequently addresses the audience with impromptu remarks about the season or the current concert’s program. This lax environment is deceptive: Freisinger Chamber Orchestra consistently produces high-quality performances of major works while managing to champion young artists and new composers as well. It is gratifying to see that the levels of accomplishment that hide beneath Peter Freisinger’s amiable and — if it isn’t rude to say —unassuming demeanor, have recently garnered high praise from the American Prize committee. It should also be noted, of course, that in addition to this work, Freisinger also wears a press hat for the Boston Musical Intelligencer. Sunday’s performance lived up to these laurels, although somewhat obscured by the venue. The concert opened with Mozart’s Oboe Concerto in C, K 314; the work seemed incredibly young and optimistic in the hands of Freisinger and the FCO, particularly in the first and final movements. Much of this had to do with oboist Nathan Swain, whose rare ease and fluency with the instrument presented a graceful comfort and precision to the work in these more fluid portions. Yet more delicate moments, particularly the Adagio non troppo of the second movement seemed to plod, the nuance somehow lost in the gaping nave and carpeted aisles of the sanctuary. Venue seemed less an issue in the second work of the afternoon, the world premiere of Dan Shore’s Bergen Variations, commissioned for the ensemble. By itself, Shore’s theme is worth hearing. A melody imbued with enough northern European melancholy to be worthy of Vaughan Williams or Jean Sibelius, the brooding chorale is initially set in the rich timbres of the lower strings. (During a brief question/answer session after the premiere, Shore informed the audience that the melody was originally part of an abandoned opera, and was meant to be an imitation of a Lutheran chorale.) Shore’s variations are by no means trivial or easy to follow: each one showcases the sections of the orchestra, using the melody as a loose guideline and traverse a surprisingly complex and, at times, dystopic landscape, at points verging on atonality, at others, reminiscing some lost folk heritage. The complete commitment of the orchestra achieved a successful premiere. After intermission, Freisinger took to the piano to accompany tenor Sean Lair in a series of four arias. Lair, a recent graduate of the New England Conservatory, was featured in the role of Evangelist last year in FCO’s performance of Bach’s St. Matthew Passion. This program promised to showcase his considerable talent to a greater extent, featuring him in arias from four French operas: Berlioz’s “O blonde Cérès” from Les Troyens, Delibes’s “Ah! Viens dans la forêt profonde” from Lakmé, Halévy’s “Loin de son ami” from La Juive, and Donizetti’s “Ah! mes amis” from La fille du régiment. Certainly, Lair has a significant vocal ability; his well-grounded lower range supports the expanse and precision of his upper register. But in these songs the venue presented the greatest challenge of the afternoon. The intimacy possible from a piano and a single singer is not achievable in the nave of the sanctuary of Old South Church. Freisinger’s considerable work was lost to the cavernous space. Furthermore, Lair confusingly stepped down from the chancel to perform the arias at the level of the pews and the piano, obfuscating much of his sound and obstructing our view of his person. Further consideration of the space and its practicalities might have better served both performer and audience. The performance closed with Haydn’s Symphony No. 45 (“Farewell”) The symphony is odd for a number of reasons, one of which is key — F-sharp minor was no trifling matter at that time, and Haydn had a special horn made expressly for the piece — but also because of the capricious shifts in mood throughout the work. Regardless of their temporal proximity, Mozart’s concerto has little in common with the Haydn symphony. Despite difficulties with the space, the FCO is again to be admired for a satisfying read of the work that crisply changed mood at the turn of a dime. Haydn’s famous prank during the final movement of the symphony still managed to cull a laugh from the audience on Sunday afternoon as orchestra members gradually sauntered off the stage during the final measures, even Freisinger himself — leaving, at the end, only two violins in duet to bid audience members farewell. FCO repeated a performance of Shore’s Bergen Variations as an encore. This was the only concert of the ensemble in the 2012-2013 season, though players are invited to an open reading of Berlioz’s Symphonie Fantastique in November. This brevity of the season is disappointing, and given the ensemble’s history in championing young musicians, somewhat sad as well. 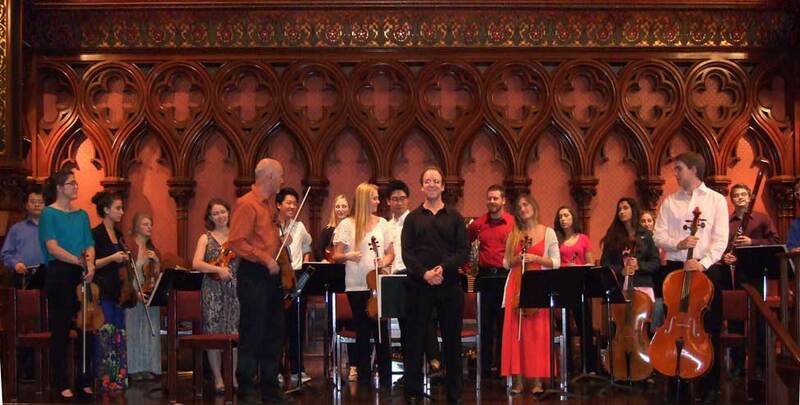 Sudeep Agarwala performs with various singing groups in Boston and Cambridge.